So, now that I’m not feeling any of the side effects of chemo, I consider myself officially done! There is much rejoicing!! 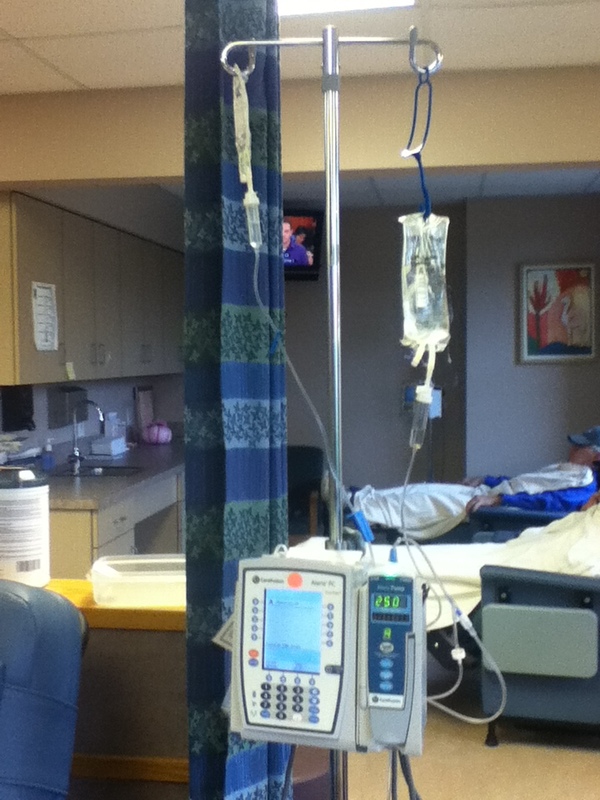 I thought I’d do one last post on chemo, specifically on the unexpected and odd side effects I experienced with chemo. Everyone knows about the hair loss, nausea and vomiting, and impacts on the blood cells, but there’s more to it than those symptoms. For example, I never lost all of my hair. Most of my head hair fell out, and I haven’t had to shave since I started chemo (a small benefit), but I never lost any of my arm hair or my eyelashes. Eyebrows did end up going. At least my hats have a low brim, and you couldn’t see the lack of eyebrows too obviously. The one place I really missed hair (besides my cold back of the neck) was in my nose. Not having nose hair caused a surprising amount of annoyance, mainly associated with the dripping of snot. There just wasn’t any hair to slow down the trip of that snot out of my nose. One odd side effect was the impact of chemo on my fingernails. If you look closely in the photo, you might be able to see the stripes on my nails. All of my fingernails have four white, horizontal stripes on them, corresponding to a cycle of chemo. I’m fairly certain that there will be six stripes by the time the nails grow out. At least I never lost the nail. I’ve heard from some other friends who went through chemo that they lost fingernails or toenails. Finally, and this one might be TMI but it’s for posterity and so others know what to expect, I stopped menstruating. It was most surprising because I specifically asked at our chemotherapy orientation meeting if that would happen and the nurse said no. It may or may not be permanent. I’m not really worried about it, since I’m done having kids and it’s one less hassle to deal with while undergoing chemo, but it was unexpected. And those were some of the odd things chemo did to me. Hopefully, no long-term impacts (beyond eliminating the cancer). 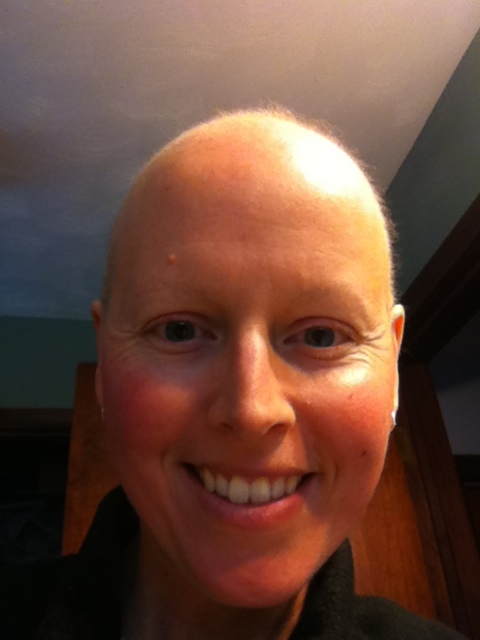 This entry was posted on November 19, 2013, in chemotherapy and tagged hair loss, side effects. I had my third (and last, for a while I hope) breast MRI yesterday. Dr. Li ordered it to see if that last little bit of cancer is gone after three more cycle of chemo. I am trusting that it is, but I’ll find out the result when I meet with Dr. Engel, the surgeon, next week. 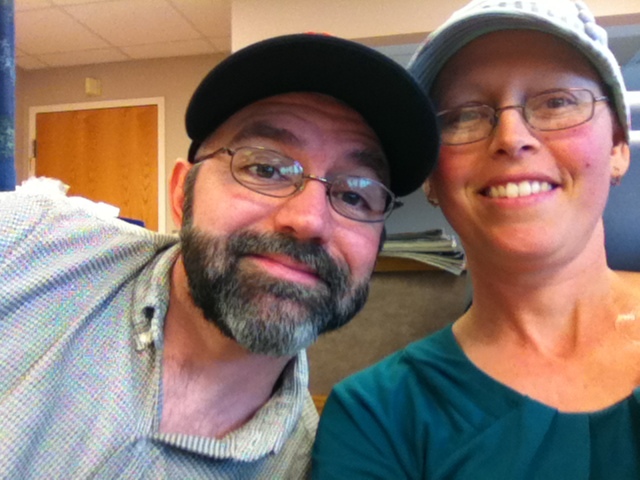 Yesterday was the beginning of the upswing from chemo, but I still felt a bit nauseous. This particular cycle has been a little higher in the nausea than many of the previous ones. I didn’t think anything about it, though, until I had to lay on my stomach for 20 minutes inside the MRI. Not the most comfortable of positions. Even worse, it was actually warm inside the MRI room. By the time I was done, I felt a bit light-headed. The room was all sparkly for at least five minutes. I got a glass of cold water and put my head between my knees for a minute or two and felt much better. The higher level of nausea didn’t really go away until I got home and took some meds, though. I wanted to get a photo of the apparatus they use to capture breast tissue, but the magnets from the MRI would have fried my iPod if I had taken it into the room. This photo was taken from the door. I lay on my stomach on the bed projecting from the MRI, with my forehead cradled on a foam structure. You can just see the cutout for the right breast curving below the head support (there’s a similar hole for the left breast). Arms go over the head (see the grey rectangular pad for an arm on the upper left of the bed), and you slide into the MRI. They hook up your IV to be able to add the gadolinium for contrast, and listen to clonking and whirring for 20 minutes or so. Relax as much as possible since the MRI captures more tissue if you’re relaxed than if you’re tense. The other item of note was the pattern for my gown – it was different from last time. Not too bad, although gray really isn’t a festive color. At least we get some spots of red for cheer. This entry was posted on November 15, 2013, in tests and tagged breast MRI, elements, gown pattern. I must say, with the change in weather, I’ve noticed the cold a lot more than I used to. The back of my neck, particularly, feels the cold air. It’s really not used to being exposed this time of year. The only time I used to have my neck bare was in the summer when it was really hot and sweaty. My hats keep the top of my head nice and warm, but my neck feels left out. The one advantage of the cold weather is it’s easy to cool off when I get a hot flash – just pull the hat off for a couple of minutes and I cool right down. Amazingly, my hair is already starting to grow back on my head. It never really all fell out, but it’s definitely thicker now than it was a month ago. The sad part is you can’t really see it yet. It’s nice and fuzzy, and there are some longer bits of where it wasn’t shaved too tight to my head, but it’s still baby fine. Miss Curiosity asked me today when I would stop wearing my hats, and my answer is when I can not see scalp on my head. As you can see in the picture below, the scalp is pretty evident. I wish it would regrow the way StatsGuy’s hair does – nice and dark. The other advantage of the hats is they hide my lack of eyebrows. All but a few eyebrow hairs managed to fall out, but there’s a sprinkling of regrowth (you can kind of see it in the picture above). I’m half tempted to just pull the long hairs out so everything is even as it regrows. At least I’m done with chemo and everything can start to regrow together. I haven’t minded the lack of body hair, but I would like the facial hair to come back quickly. We’ll see if the eyelashes fall out – I’ve heard from several friends who went through chemo that they lost their eyelashes weeks after chemo ended. 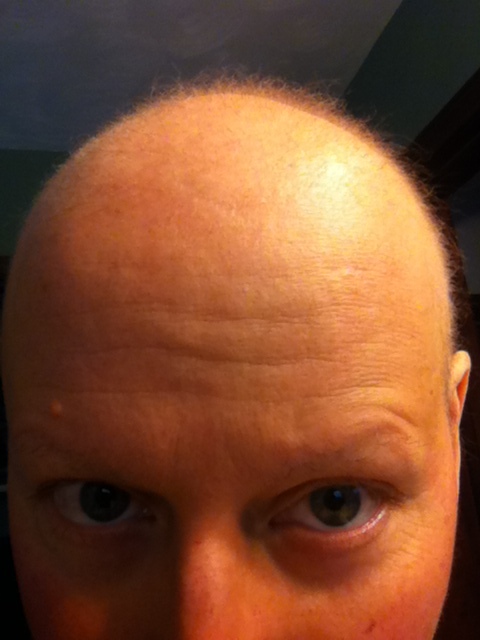 This entry was posted on November 10, 2013, in chemotherapy and tagged chemo, hair loss, side effects.